Commemorative statue to the Code Talkers. Bev Stevenson and I took a trip to New Mexico and came back through Window Rock, AZ, which is right on the border. 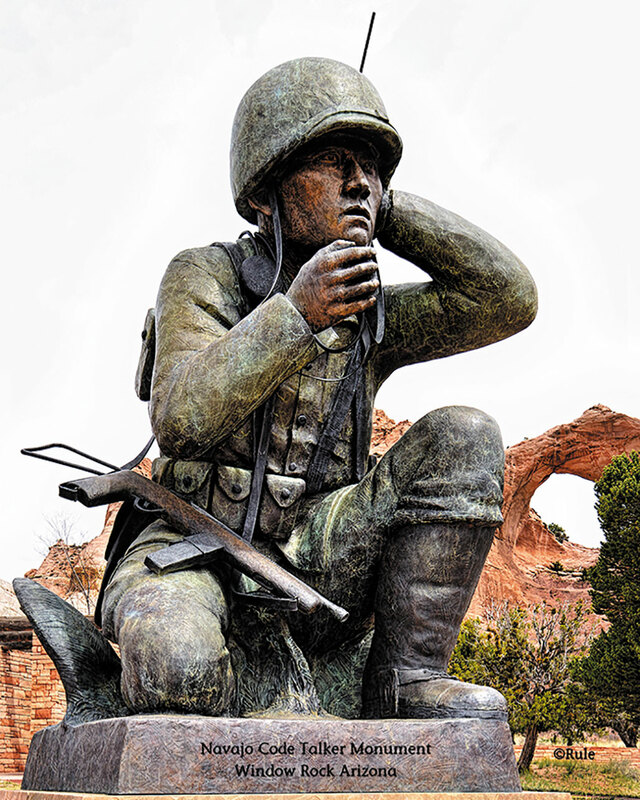 If you are even close to that area it is well worth the stop to visit the memorial to the Navajo Code Talkers. It is an amazing story and unfortunately one that is not widely known. The window rock makes a beautiful backdrop to this impressive monument. As I was knocking the sand out of my shoes, a school bus drove up and parked. It was a very special moment to see elementary age Native American children circle this soldier. We owe a huge debt to these men who indeed helped us win the war. Photo credit, Charlene Rule.